I would like to introduce a very special guest today, please welcome Cynthia from my favorite new blog, The Perfect Life. Cynthia is incredibly glamorous, and her blog provides an elegant glimpse into a most refined life she has created for herself, her lovely daughter, Alice, and adorable mini Aussie, Chase. In addition to decorating, Cynthia enjoys traveling, beautiful clothes, gardening, cooking,and table setting. Other interests we share include Turner Classic Movies and doing things the “old fashioned” way. Intrigued to learn more about what inspires Cynthia,I asked if she would be willing to conduct an interview for this post, and she graciously agreed! Q: Your home is so beautiful, and I love how you recently transformed your “papillon powder room“. Which designers have influenced your décor style over the years? A: Thank you Andrea! Nancy Lancaster without a doubt has always been the biggest influence in my decorating. She was the real deal, as her homes were not really “decorated” but were really used, and they seemed to match her extraordinary life. Color tells a story. Clearly her homes were an extension of her soul. 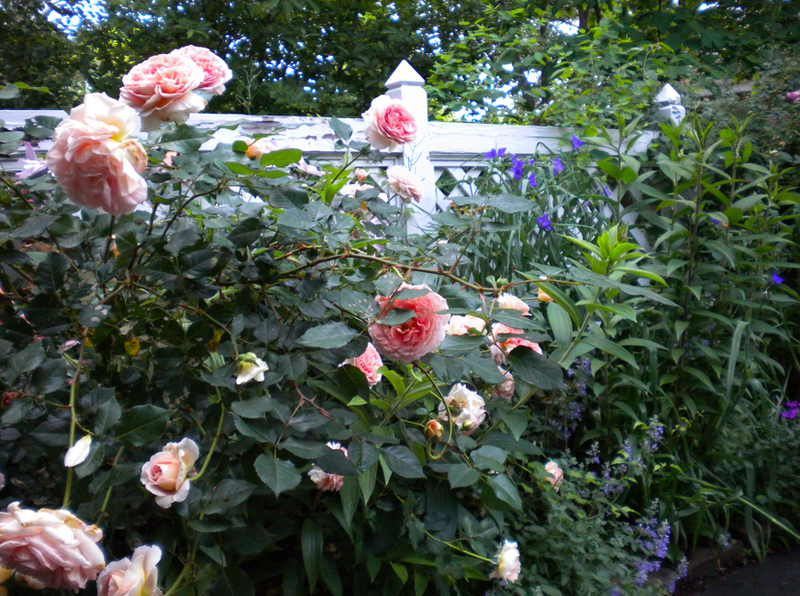 There is something about the combination of that classic “English Country House,” combined with horses, and rose gardens! The femininity and refinement of her homes and gardens was breathtaking. I like to think I have my own little “Coach House”! I also admire Bunny Williams’ Connecticut home, and the work of Miles Redd. 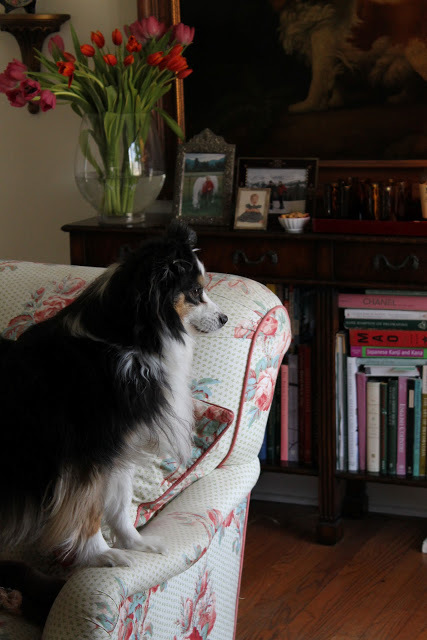 Chase lounges on a lovely Chintz sofa, keeping guard of Cynthia’s extensive book collection. A few of Cynthia’s books. Q: It appears we both share an obsession with fine china and sterling. 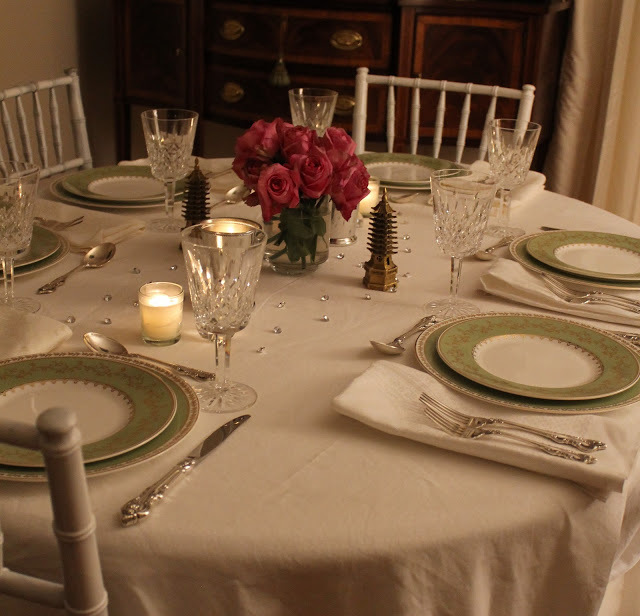 What are your secrets for throwing a lovely dinner party? A: My secret for throwing a lovely dinner party is I only invite people I love! Years ago, I concentrated on cooking really fabulous,complicated food, and baking serious deserts. Every dip I served was a labor of love. I still occasionally do the labor intensive, gourmet meal that takes days, but lately it seems like everyone I know eats gluten free, or is a vegetarian, or has restrictions. I keep the food really simple and fresh, and make the sensory pleasure come from the visual feast. We eat with our eyes anyway. It is also helpful to group family and friends together according to food preferences. Great drinks in abundance, from sparkling water, to cocktails, to after dinner coffee, are also important. 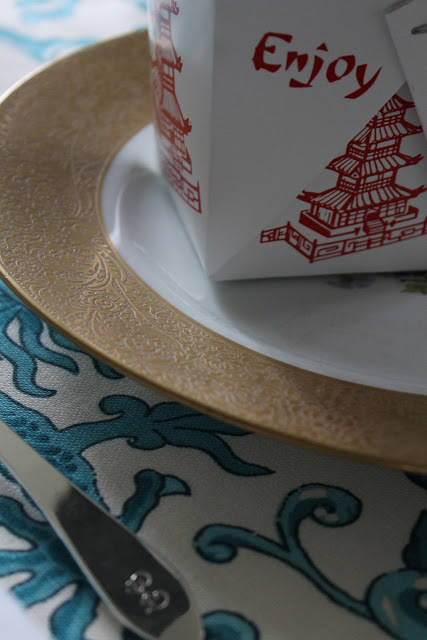 China, sterling, and gorgeous linens are a serious obsession! Setting a nice table simply gives me a lot of pleasure. I thought I might grow out of the obsession years ago, but I am still adding to the collection! Picking fresh flowers from my garden, and arranging them is something my daughter does for me so beautifully. Chinese take-out doesn’t get any more elegant than this! Tablecloth in Scalamandre Chi’En Dragon. Click here to see more of The Perfect Life’s Chi’En Dragon take out dinner.Faneuil Silver by Tiffany & Co.
Cynthia’s extensive fine china collection includes this Martha Stewart for Wedgewood pattern. The sterling is El Grande by Towle, and crystal by Waterford. This tablecloth is made from Sister Parish Design’s “Ogden” in coral. Wedgewood china in Crown Ruby, and Flavia goblets by William Yeoward. The napkins are a souvenir from a trip to Ireland, and the basket is from Ikea. Q: Where is your favorite place in the world to visit? What other adventures are on your bucket list? · Continue to travel the world with Alice. · I would love to see the gardens of Haseley Court. · Get my small furniture and accessories line off the ground. · A tiara of my own. With the life, and the man, and the Ellie Saab gowns to go along with it. 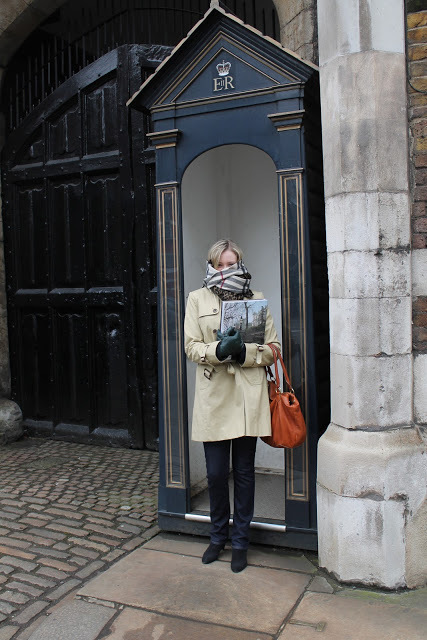 Alice stands guard in Chilly London. Q: What items do you consider essential for traveling in style? 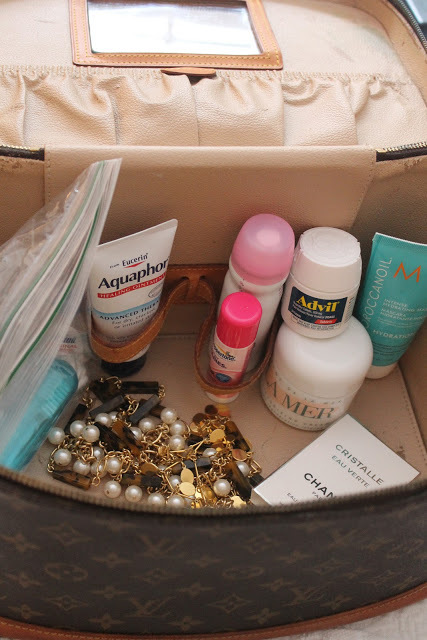 A: The items I consider essential for traveling in style are my daughter, my Louis Vuitton train case, sunglasses, lots of Ziplock baggies to protect my clothes, a good paperback, a black knit dress, and a red lipstick. Cynthia’s Louis Vuitton Train Case. Q: What is your philosophy when it comes to creating your amazing wardrobe? A: Dress like a lady, in timeless designs that don’t date. Have a good tailor. Know what colors work for you. Quality over quantity. Own some real jewelry, and tons of costume.Classic, three inch pumps are the sexiest shoes one can wear! Pencil skirts, pumps, and cardigans are my staples.I have always loves the Nancy Mitford quip,“Good clothes are a matter of health.”As a child, I loved old movies because of how the women dressed.They had coiffures, and handbags, and chiffon dresses! The way Doris Day looked in her movies was smashing.The character of Vesper Lynd in Casino Royale is appealing to me. I was so inspired by that black fedora, and trench! Wow! I relish the rituals of femininity, and being a woman in full.Trends don’t appeal to me. I was watching the movie the Queen the other day, with Helen Mirren, and realized how much I love a stacked heel, and a great brooch! Sophia Loren is one of the best dressed women on the planet! One of Cynthia’s exquisite outfits. Q: You have written that red lipstick is your signature color. What is your go-to shade, and what are your other favorite beauty products? with pink lipstick. Very old school! Q: How are you influenced by old movies? Which one is your favorite? A: Oh Gosh! There are too many to love!! Anything from the 30’s will do. William Powell, Myrna Loy, Jean Harlow, as well as Betty Davis are my favorites. My Favorite Wife, Goodbye Mr. Chips, My Man Godfrey and The Thin Man series are all a part of my movie wardrobe. The subtlety, elegance, and innocence of that era draws me in. Can’t forget about Fred and Ginger! Oh the clothes! The feather-light dancing! Makes me cry! One of my all-time favorites movies was on TCM just the other day, so I will just choose it as my favorite – Murder at the Gallop. Margaret Rutherford as Miss Marple is too fabulous. I love everything about it! What’s not to love about this lady, with her sharp mind, quick wit, and great manners? She’s living in England, staying in great hotels, and wearing tweedy suits. She looks like she’s having more fun than the young people, riding the horse, and doing the twist. Sublime. Q: What inspired you to create your blog, The Perfect Life? A: I created my blog during a slightly rough patch in my life. I simply had a lot on my plate, and it just felt great to put on my rose coloredglasses, and write! I hope you enjoyed getting to know more about this elegant and classy glamour girl. Make sure to visit The Perfect Life to follow her adventures! Thank you, Cynthia for the lovely interview! Thank you so very much for introducing me to such a stylish and wonderful lady! Thank you Andrea for sharing this blog. I now have Creating The Perfect Life on my list to follow! Great find! Both you ladies have great style & spirit. It's long been a policy of mine never to leave the seat up in a 'Papillon Powder Room'.